At Washington Green Spa & Wellness, we don't do cookie-cutter treatments. Each service is tailored to your specific needs. ​to receive the best service possible. ​Did you know that your HSA or FSA account may cover massages? We have also found that some health insurance companies are reimbursing their clients for massages when you get pre-approved. All first time appointments include a consultation within your scheduled time to ensure you reach the goals of that specific treatment or service. Therapeutic Massage is a great way to relieve pain, stress, anxiety & tension while improving range of motion and boosting the immune system. Your therapist will use a combination of techniques to help you reach your wellness goals. The amount of time you schedule will determine how many separate areas the therapist will be able to focus on. The perfect date for any celebration or just because you both need some time away from the kids. Enjoy a side by side massage or facials next to our beautiful fireplace. Upon advanced request, we can have a bouquet of flowers from a local florist waiting in your room. ​*Please note: this service can not be scheduled through our online booking scheduler, please call for availability. 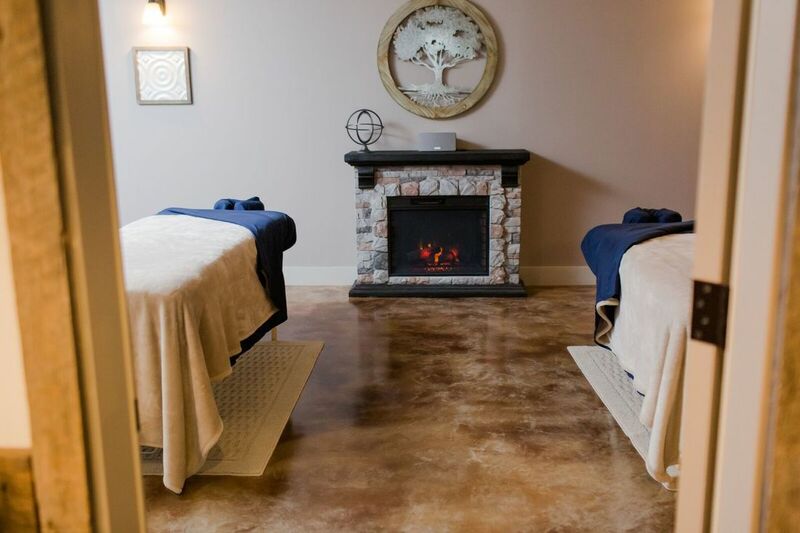 Sticks & Stone Massage incorporates the use of warmed, smooth basalt stones to relax, nurture, and restore. Hot stone massages helps to deepen the relaxation of targeted muscles. The penetrating effects of the heat allows the effects of the massage to be delivered deeper in the muscles without excessive pressure. Chinese Cupping Therapy is a style of massage where Chinese cups are incorporated with traditional massage techniques to help you relax more deeply and provide remarkable results in debilitating and stubborn cases. The suction (which is created by an air pump, not fire) creates a negative pressure which helps to break up any adhesions and bring fresh blood to the area for healing and pain relief. In many cases, cupping can leave a temporary mark that may last for 2-10 days. These marks do not hurt. When your life energy is low, it is more difficult to deal with stress; you may not sleep well, and you're more susceptible to illness. When your life energy is strong, you feel strong, can more easily deal with stress, and are less likely to get sick. Reiki is a technique that increases a persons supply of life energy. Reiki is administered through the hands of a Reiki practitioner with the client lying fully clothed on a massage table. The Reiki practitioner places his or her hands at locations around the head and shoulders, the abdomen and on the legs and feet. Tissue is not manipulated. The practitioner's hands are simply held at each location, lightly touching or slightly away from the body. A Reiki session feels like a wonderful, glowing radiance that surrounds and fills the client and includes feelings of relaxation, peace & well-being while also promoting healing. Prenatal Massage, Belly Facials and Prenatal Packages can be found here. A sugar scrub combined with the antioxidant healing power of blueberry scrub, to leave you feeling refreshed and your skin feeling smooth. Your skin will appear healthier and your moisture levels will be improved. Your skin will be radiant when you're finished! Extra time can be added for more focus on problem areas during the massage portion of the scrub. ​Pamper yourself with this marvelous spa treatment just for your feet! You will begin to relax with a detox foot soak while you sip a warm cup of detox tea in a quiet room; your therapist will then exfoliate your feet with a sugar foot scrub treatment. Once your feet have been dried, you will move to a treatment table where your therapist will wrap your feet in our Luxurious EcoFin Foot Treatment and warmed boots while you receive a scalp massage and then to top it off with a renewing foot massage. ​While many think Reflexology is just another word for foot massage, it is much more. While it is relaxing and great for your feet, it also induces a healing response in corresponding organs and areas of your body through specific areas of your feet or hands. Reflexology addresses things from headaches to sinus problems, balancing blood pressure, reducing anxiety, balancing hormones and more. A few benefits of regular reflexology include boosting immune system, increasing circulation, promoting healing, and balancing energy to allow the body to heal itself, as nature intended. A customized airbrush tan is perfect for weddings, events, vacations, proms, or just swim suit shopping. Get a perfect sun-kissed tan in 15 minutes! Tips for best results: before your tan get your pedicure or manicure and any waxing, exfoliate and avoid using any lotions, deodorants, or perfumes the day of the tan. Wear dark, loose fitting clothing to go home in. You will need to avoid water for 2-4 hours with the Express or 6-8 hours with the Regular after your tan. On average, tans last 7-10 days. ​Customize your next massage even more with one or two of these additions to your treatment. Once you've chosen your main service, you will have the option of adding these. 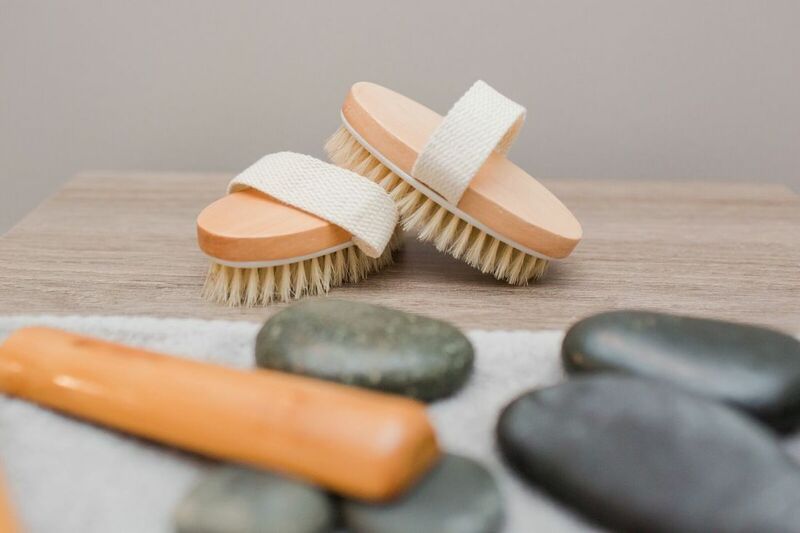 Dry brushing has many benefits including: stimulating your lymphatic system, exfoliation, increasing circulation, reducing the appearance of cellulite when done regularly, stress relief, and it's invigorating. Keep your two dry brushes as our gift to you for in-home use! Receive $5 off your next Dry Brushing Treatment when you bring your brushes with you. The addition of essential oils to your massage can enhance your relaxation, restore a sense of balance to your mind, body & spirit, aid in easing your pain or discomfort from an injury and more. Essential oils can be diffused in the room or combined with the massage oil & massaged into the skin. Enjoy additional time spent on your feet with a Sugar Scrub Foot Treatment to exfoliate and a moisturizing foot massage with essential oils. A perfect way to revitalize your feet! Pamper yourself with this marvelous spa treatment just for your feet! You will begin to relax with a detox foot soak while you sip a warm cup of detox tea in a quiet room; your therapist will then exfoliate your feet with a sugar foot scrub treatment and end with a moisturizing foot massage. ​EcoFin is a plant-based, petroleum-free healthier alternative to paraffin. A rich blend of palm, soy, jojoba, and organic coconut oils plus shea butter, vitamin E and essential oils moisturize and leave your skin soft and supple. ​​EcoFin is a plant-based, petroleum-free healthier alternative to paraffin. A rich blend of palm, soy, jojoba, and organic coconut oils plus shea butter, vitamin E and essential oils moisturize and leave your skin soft and supple. ​Replenish your skins' natural beauty while you nourish and relax your mind and body, achieving amazing results with Eminence Organic Skin Care and our Professional Estheticians. All facial treatments are customized and will begin with a skin analysis to determine the best Eminence Organic Skin Care products to use to achieve optimal results. This facial will assist in the treatment of many different kinds of acne. You will find your skin soothed, rejuvenated and on the road to clarity. This facial will incorporate a natural retinal alternative to transform skin, increase collagen production and smooth fine lines and wrinkles. This facial will help sooth irritation, reduce redness, rejuvenate and hydrate your skin. This facial is perfect for teens fighting acne, giving them the self-esteem boost they will find with clearer skin. Up-to age 19. A must-have treatment for anyone struggling with back acne, preparing for a formal event or even a beach vacation. A Belly Facial is the perfect way to relax and nourish your skin with the best organic products around during all stages of pregnancy. Our Belly Facials will focus on your expanding belly to help soften skin, reduce itching that can occur with a growing belly and may aid in the prevention of stretch marks. View all options and details here. While waxing isn't the most relaxing experience, we do our best to make it as comfortable as possible with the use of a lavender infused, cool compresses to reduce inflammation and redness. Make your next skin care treatment extra special with one or more of these enhancements. You won't be disappointed. Once you have chosen your base service, you will have the option to add these enhancements. With this four-step treatment you will see improved texture, the reduction in fine lines, dryness and dark spots. The treatment will also stimulate the repair of the delicate skin around the eyes, improving the appearance of elasticity. Give your lips the attention they deserve with this treatment designed to reduce the appearance of fine vertical lines around the lips, exfoliate and plump leaving your lips silky, smooth & hydrated. Facial Cupping is a great way to improve the health and appearance of your skin by stimulating collagen production, eliminating puffiness, reducing fine lines, lightening skin imperfections, shrinking pore size and allowing the product to penetrate the deeper layers of the skin. Maximize the results of your facial with a gentle, plant-based peel. Unlike chemical peels, our lactic-acid peels require little to no downtime. Our professional peels have more active ingredients for immediate results and faster skin-cell turnover. The natural coolness of jade reduces pore size while the gentle rolling action moves lymph, reducing puffiness and improving circulation to create a more youthful appearance. Jade rolling can also aid in releasing sinus congestion, reducing stress, reducing inflammation and tone facial muscles. Be camera-ready for your next event with our Professional Makeup Application with our Esthetician. On-Location Makeup Application Available, call for pricing. You will first enjoy a Dry Brushing Treatment to help wake up your senses, followed by a 90 minute Therapeutic Massage incorporating some of your favorite heated Sticks & Stones and Mother Earth heated pillows to ease stress, tension and work on any problem areas. Next, you will be treated to a gentle, organic face mask while receiving a calming scalp massage. An essential oil of your choice may be diffused in your room, upon request. Keep your Dry Brushes, as our gift to you! Replenish your body with this exquisite treatment including a detox foot soak with an exfoliating foot scrub and massage, a 90 minute massage incorporating Mother Earth pillows to melt the stress and tension away, and a 60 minute customized facial using the award winning Eminence Organics Skin Care line. *Please note: because this service requires the schedules of both the Esthetician and Massage Therapist to line up, this service cannot be scheduled through our online booking scheduler, please call for availability. ​The best way to restore your body and start fresh. This spa package includes a Dry Brushing Treatment to wake up your sense, a Glow Treatment for maximum full body exfoliation and soft, smooth skin followed by a relaxing 90 minute massage incorporating heated Mother Earth pillows and then a 90 minute customized facial using the award winning Eminence Organic Skin Care line. *Please note: becaus this service requires the schedules of both the Esthetician and Massage Therapist to line up, this service cannot be scheduled through our online booking scheduler, please call for availability. ​Feel the ULTIMATE Relaxation and indulge all of your senses with one of our Therapists Choice Options. Each session will be a mystery to engage your senses. During this three hour session your therapists will decide which treatments would best suit your needs. It will be a combination of any of our services with a minimum of three service options picked specifically for you by your therapist (one of those being a therapeutic massage). Bringing stress and tension relief right to you! You receive your massage in a specialized ergonomic chair that we bring to your location. These mini massage are perfect for customer appreciation events, boost employee morale, as a stress buster for bridal parties and more! A great way to spend a girls weekend, celebrate a birthday and more! We bring everything we need, you provide the space. A minimum of two 60 minute massages is required for in-home massages. All sessions are by appointment only, it is recommended you call at least 24 hours in advance to schedule your appointment. It is strongly advised to call at least a week in advance if you are wanting a late afternoon, evening or Saturday morning appointment. If you need to cancel or reschedule an appointment, please give 24 hours' notice. Failure to do so will result in the same fee schedule listed in the no-show policy. Exceptions are made for weather and emergency situations. Clients who arrive less than 15 minutes late will receive the remainder of their session, which will end at the scheduled time, and pay will be full price for the appointment. It is at the massage therapists' discretion whether or not to accept clients who arrive more than 15 minutes late.